I was mightily surprised by Summer of the Gypsy Moths. 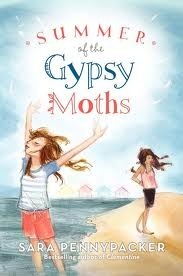 I am not familiar with Gypsy Moths and so the title actually put me off a little. I heartily enjoy Sara Pennypacker’s Clementine series and so I was willing to give this one a try due to the author. The main character is 11-year-old Stella. Stella has come to live with her great-aunt after being removed by Child Services from her mother’s care. Stella’s mother has a history of being unable or unwilling to take care of her daughter. Now that her grandmother–who used to fill in the gaps left by her mother–has died as well, Stella works overtime to create a home for her mother in which she will remain with her daughter. When that doesn’t work, Great-Aunt Louise steps in. Louise also takes in another 11-year-old foster girl named Angel, intending for the two girls to each have someone her own each in the home. Unfortunately, both damaged in unseen ways, Angel and Stella do NOT get along. When Angel and Stella are forced, however, to face another life-changing event together they learn to appreciate and value parts of themselves and each other they previously disregarded. Stella’s voice is amazing in its raw honesty, preferring to skirt the edges of insight into her mother which allows her to concoct a “happy ending” for the two of them at Louise’s. As Stella allows her own insights into herself, her mother and life to gradually emerge the reader is in lock step with her. The story is in the tradition of one of my favorite books of all time: The Great Gilly Hopkins by Katherine Paterson. The traditional “happy ending” does make an appearance in Gypsy Moths and some of the circumstances which lead up to it strain the limits of realism but the path along which Stella travels to get there is rife with the realism of the times we feel neglected or wounded by loved ones, our struggle to make sense of those feelings and situations, and the ways in which we re-surface and direct our lives anew. Definitely a departure from the Clementine books, make sure that a young reader choosing this book for an independent read knows that and is ready for mature material. I think this story also gives the reader a chance to grow in maturity and insight along with Stella. Books that possess this gift are rare and worth experiencing.